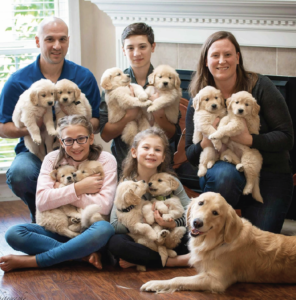 John with his wife, Renee, and their children: Nick (16), Julia (13), and Lauren (8) with one of their dogs, Stella, and her 10 puppies. “It is a family.” This is how Team Leader John Perella, affectionally known as JP, described BFW when asked what he enjoys most about working here. All the better for him, as he is no stranger to family life. He grew to love construction at a young age after helping his father renovate their home in Lancaster County as a kid. From nearly 19 years of happy marriage to his wife Renee, to coaching his son Nick’s baseball team and helping raise two daughters Julia and Lauren, John has played a vital role on teams his whole life. Ever since starting as a carpenter at Berks • Fire • Water five years ago, John hasn’t missed a beat, becoming a Team Leader in just three years. As a leader he has consistently proven himself as a critical member of the BFW team. He and his team recently responded to an emergency call in the middle of the night after a fire began at a local senior living facility. John played a key role in efficiently and promptly getting the job underway so that the residents were settled back in their homes within a span of just five days, allowing them to enjoy the holidays. During a recent company meeting John was recognized for this accomplishment but was quick to attribute the success of the job to his team and everyone at BFW who contributed, showcasing his selflessness and passion towards his people and the job. John also takes the initiative to continually learn more about his job, taking advantage of hands-on training whenever possible. This also helps him teach his team, remarking how much he enjoys seeing when others “get it” once things are “explained in an easier way.” To him, the training “solidifies what you learn in the field and the science behind everything.” John is just one course shy from becoming an IICRC certified Master Water Restorer. 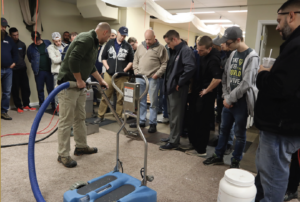 John training Restoration Technical Institute students during an IICRC Water Restoration Technician (WRT) course at our hands-on training center. In his free time, John enjoys spending time with his family, which is completed by two Golden Retrievers, Stella and Rookie. He also enjoys watching sports, most notably Philly teams and Penn State football. When he’s on vacation, you are likely to find John at the Outer Banks or on a cruise ship. John Perella is a highly respected and indispensable asset to the team. Using the teaching and leadership abilities he has learned over the years, he continues to exemplify the values and principles that BFW was founded upon. John’s passion, drive and dependability further prove that Berks • Fire • Water is not only a team but a family.